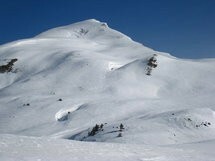 This Sunday, February 26 (if the weather is ok) I organize a snowshoe hike to a nice southern summit of Aravis: Pointe de Mandallaz 2277m. From Gaillard we drive to Thônes, Manigod and Sous l’Aiguille 1158m. From there we go up to Aulp Fier D’En Bas, Champ Tardif and arrive at the top. Elevation gain: about 1120m. Distance: about 14 km. This hike has not major technical difficulties. But it is sporty. The final slope is steep. Maximum 12 experimented and sporty hiker.